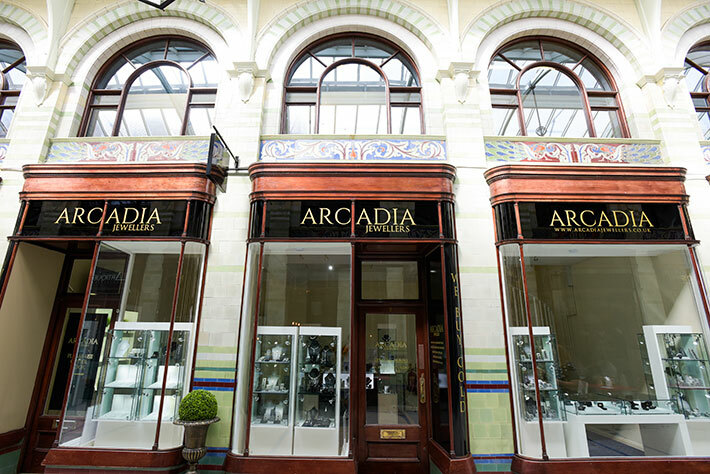 Arcadia​ ​is an​ ​independent​ ​family jewellers situate in​ ​the​ ​heart​ ​of​ ​Norwich, ​ ​in​ ​the​ ​prestigious​ ​Royal​ ​Arcade. ​Our​ ​existing​ ​City Centre premises house​ ​our​​ ​workshop, ​which​ ​is​ ​run​ ​meticulously​ by​ ​our​ ​Master Goldsmith. Our​ ​beautiful​ ​store​ ​with​ ​our​ ​team​ ​of​ ​experts​ ​on​ ​hand​ ​is the​ ​perfect​ ​location​ ​for​ ​your​ ​special​ ​purchase. Their​ ​attention​ ​to​ ​detail​ ​is​ ​impeccable​ ​especially​ ​when​ ​it​ ​comes​ ​to​ helping you ​to select ​the​ ​finest​ ​pieces​ ​of jewellery, which we hold in our safes and on display. We​ ​have​ ​scoured​ ​London’s​ ​famous​ ​Jewellery​ ​quarter​ ​Hatton​ ​Garden​ ​for​ ​the​ ​most “on​ ​trend” designers, as well as sourcing our raw materials ​from ​top​ ​quality​ ​specialist suppliers ​including​ ​Henig Diamonds and Wards Lapidarists, with whom we have developed strong working relationships over the years. We​ ​specialise​ ​in​ ​beautiful​ ​engagement, wedding​ and eternity ​rings​ ​as well necklaces, bracelets and other ​fine​ ​jewellery to suit all pockets and tastes. One​ ​of​ ​our​ ​exclusive​ ​designers​ ​is​ ​Lucy​ ​Quartermaine​, ​an​ ​award​ ​winning​ ​young, English contemporary​ ​designer​ ​and​ ​silversmith. ​ ​​Her​ ​designs​ ​can​ ​be​ ​seen​ ​in​ ​many​ ​top​ ​magazines such​ ​as​ ​Red, Vogue, ​Cosmopolitan​ ​and​ ​many​ ​more. ​She ​is​ ​also​ ​a​ ​favourite​ ​with​ ​many celebrities. In December 2016, Lucy won the prestigious award, ‘Jewellery Designer of the Year’ at the UK’s Jewellery Awards. Lucy creates her stunning pieces of handmade sterling jewellery taking her inspiration from everyday life. Arcadia​ ​Jewellers​ ​also​ ​offer​ ​a​ ​manufacturing​ ​and​ ​repair​ ​service​ ​to​ ​restore​ ​and​ ​refurbish​ ​your precious​ ​jewellery​ ​and​ ​services​ ​range​ ​from​ ​a​ ​simple​ clean and polish through ​re-sizing ​to​ ​creating​ ​that​ ​special​ ​bespoke piece, just for you. Our team of advisers can advise on the sale​ ​of your​ ​Gold, Silver​ ​and​ Platinum jewellery, ​with​ ​absolute discretion​ ​assured​. ​In​ ​addition​ ​to​ which ​bullion​ ​and gold coins are always sought. You​ ​can​ be​ ​safe​ ​in​ ​the​ ​knowledge​ ​that we​ ​always​ ​have​ ​the​ ​most​ ​up​ ​to​ ​date​ ​prices​ ​and​ ​will​ ​ensure​ ​you​ ​receive the best possible rate. Valuations for insurance, probate and other purposes are readily undertaken at reasonable cost by our team of specialists. Our​ ​knowledgeable​ ​team​ ​are​ ​here​ ​to​ ​help​ and​ to offer sound ​advice. Please​ ​do​ ​come​ ​and​ ​see​ ​us, ​relax​ ​with​ ​a​ ​cup of coffee​ ​and​ ​let​ ​our​ ​great​ ​team​ ​help​ ​you.